Every stitch of the SmartWool NTS Mid 250 Crew Baselayer Top is optimized for today's athlete. 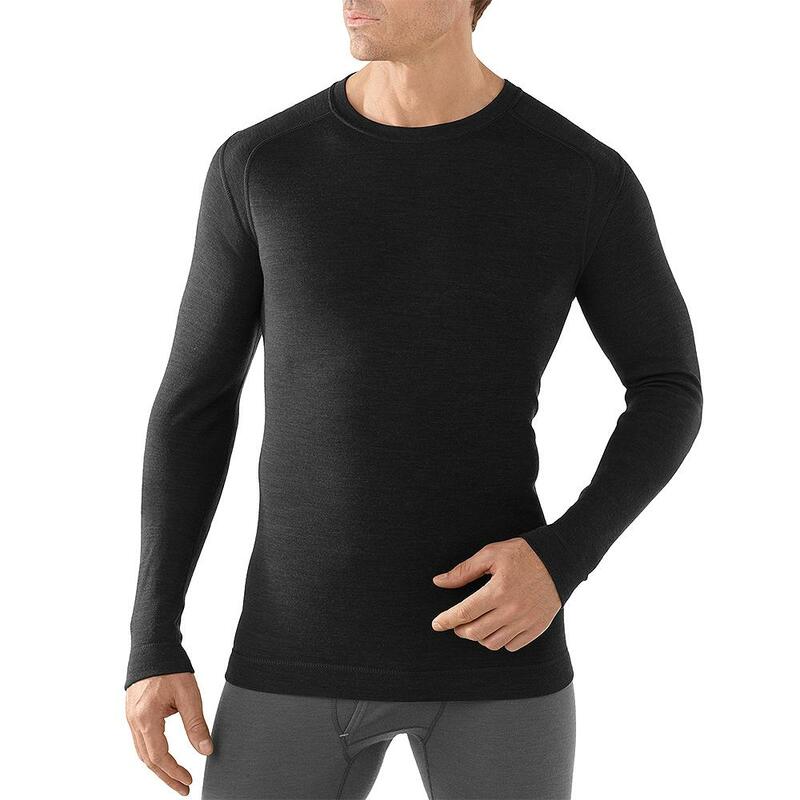 This comfortable wool shirt has seam-eliminating shoulder panels, flat-lock seams, and an interlock knit to eliminate irritation and increase comfort. The all-merino construction keeps you regulated and dry during all of your workouts while providing premium insulation. When you wear this shirt outside of a jacket, it'll protect you to the tune of UPF 50+. Bought a black midweight 250 before a college football game, very soft material with nice stretch. Usually wear XL (6'3" 225#) but bought an XXL thinking an XL would be too tight, in hindsight I would have went with the XL as this tends to run true to size. Its an athletic fit and I didn't want something super tight but there is a lot of give in the fabric. Great base layer though, very very soft, well made and WARM! Does a great job wicking and keeping you warm in a variety of temperatures. My only concern (and its very minor) is how it will hold up over time. 2 washes in and no problems so far, no pilling as I have seen reported in other reviews. Recommend washing warm wash inside out and dry on a rack. No need to separate from other clothes. All in all a great buy and will buy more of these, 5/5 stars and I'd go higher if I could. Love the shirt!! I have been wearing wool base layers for over 40 years - far better than synthetic unless you need to go light and can wash often. The Smartwool 250 from before 2012 was the BEST. Like so many other name brand companies, in an attempt to maximize profits and increase purchases, the product lines are ever0changing. You guys should learn when you produce a great product, leave it alone. The newer version 250 base layers (also the zip model) are over-sized. The Medium fits like earlier model Large, and there is too much fabric. The change was for the worst. Pity. This is my favorite sweater ever! Just bought this as an undergarment for drysuit diving. Works like a charm; warm, soft, and breathable. I wear this wool undershirt with my foul weather gear on a racing sailboat on off shore, long distances races where the weather can get very wet and very cold. This shirt, along with the long underwear, keeps me comfortable and cozy. Love it. I bought this top and a bottom as a base layer for a recent trip to Iceland. It was the perfect base layer. I wore it nearly everyday, without washing and there was no stink - even slept in the bottoms. It was a little thinner than I expected so I brought along my fleece thermals as well, but I found I never needed them. This shirt was warm on cold days and breathed during the more strenuous hikes. My typical layering system was this as base, fleece for mid on really cold days, and 650 fill down puffer as outer. I found that for Iceland in March (temps around 30-32 degrees F during day) I just needed this and one other layer. I bought this as a base-layer for camping and also for general around the house lounging. I'm a slender 6'4'' and got the Medium. It fits snugly but not too tight. The sleeves are a tad short for my arm length but that is pretty standard for me for all shirts. I wish Smartwool would make a Medium Tall size. The Large would have been better on sleeve length but too baggy overall. It's a warm base, the color is great. The real test will be during my trip to Iceland in 2 weeks. Overall, very happy with this purchase so far. I've worn 150 weight base layers for years. So, I decided to try one of these out for really cold days. I love it. It's so thick and soft, it feels luxurious, and it's very very warm for a base layer. SmartWool baselayers are the best. Keep me dry, warm, and comfortable. They don't stink and don't itch. Love it. I'm 6' 1" with an athletic build and long arms. It's hard to find a shirt that fits well and has sleeves long enough. This top is fantastic! I've tried nearly every long john type shirt I can find and this is about the only one that was comfortable in the chest, fit well at the waist (wasn't huge) and went all the way to my wrist. It's comfortable! Soft. Warm. Fits great. I love it! As soon as I got my first one - I ordered another and a third in a light weight which fits just as well! This is a very nice piece. I don't fill it out as well as the model does, so maybe I got too big of a size? However with the times I've worn it I am very pleased with the performance. I use this to go snowboarding with. It's the perfect base layer. You stay warm but not to warm. Shirt is nice and warm. Also when it gets a bit warm outside I don't find myself getting to hot in it. Fit is great! I wear this stuff every day for work or out feel naked without it! I bought the matching NTS MID 250 thermal long underwear also for my husband's birthday especially for an upcoming outdoor Gunsite event. He says the movement with warmth will greatly aid in this adventure. Thank you for such a great product. I bout this to fit under my (EMS) work shirt and it fits well, is warm and very comfortable as a first layer. I won't buy synthetics anymore for my feet or my body.